In recent months there has been conjecture that if South Africa's president Cyril Ramaphosa wins a suitably large majority of the upcoming national vote, he will be able to achieve two notable outcomes. Firstly, he'll be able reverse the governing African National Congress's (ANC's) slide into populism and factionalism. And he'll be able to see off challenges from the radical Economic Freedom Fighters (EFF), the country's third largest party. But critics and opposition party leaders hold a counter view. They argue that voters vote for the ANC - not for Ramaphosa. And that Ramaphosa only serves at the behest of the ANC's National Executive Committee. Since the NEC is the principle executive arm of the party, this means that internal ANC factionalism is more important than the electorate. In reality, both these arguments ignore the extent to which Ramaphosa's post-election reformist ability will be hampered by other factors. The most important of these is the outcome of the dysfunctional ANC list process. Historically, the compilation of the list of nominations for national and provincial MPs has been fraught with claims of fraud and vote-rigging. Another important factor is the concessions made to the ANC's alliance partners. These are the trade union federation Cosatu, the South African Communist Party (SACP), and the South African National Civic Organisation. Based on recent pronouncements, it appears that the "radical economic transformation" ideology of the Zuma-faction has become accepted dogma among alliance members. Since coming to power in January 2018 Ramaphosa has made notable strides in dismantling Zuma's "mafia state". But he is yet to gain the upper hand in the ANC's collective policy making. 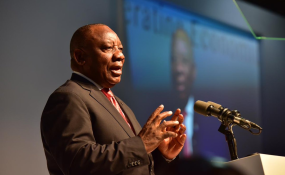 In addition to the confused statements about land expropriation without compensation, three other policy developments could prove damaging to Ramaphosa's reformist agenda. Investigate the introduction of prescribed assets on financial institutions' funds to mobilise funds within a regulatory framework for socially productive investments (including housing, infrastructure for social and economic development and township and village economy) and job creation while considering the risk profiles of the affected entities. This will require the country's pension funds and asset management companies to invest a significant portion of the savings of South African citizens in state-owned entities. The problem is that many are mired in corruption and delivery failure. There are fears that this capital will be lost. The third is the contradictory statements about the South African Reserve Bank. On the one side the Zuma-aligned ANC secretary-general, Ace Magashule, recently said that the national reserve bank will be nationalised. He said this would be in line with the resolutions at the ANC 2017 national conference. And that the aim would be to ensure the adoption of a "flexible monetary policy regime". Ramaphosa countered that this resolution was simply a "wish or aspiration". At the same time, the Communist Party claims that nationalisation of the central bank is a tenet of the National Democratic Revolution, which is the central ideology of the governing tripartite alliance. The SACP argues that it's therefore a requirement if the alliance is to support the ANC in the upcoming election. The ANC needs the SACP's support in the election if it wants to avoid losing votes. Over the last two decades the goodwill extended towards South Africa after its liberation - as well as the country's financial defences - have been exhausted. This has been because of poor governance, ill-conceived policy choices and implementation, and democratic immaturity. As with with numerous other national liberation movements in Africa, the ANC has increasingly turned to populist policies as a means to retain power. Unfortunately, indications over the last year suggest that despite his promise of a "new dawn", a Ramaphosa-led ANC election victory is unlikely to reverse the party's decline in popular support. This raises the prospect of heightened factional battles in the alliance.